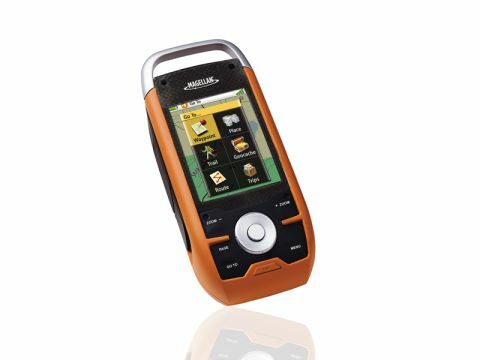 The Magellan Triton 2000 is a sat nav device designed for use in the great outdoors, and is suited to activities such as hiking, skiing and water sports. The device feels reassuringly rugged and fits in the hand well. Encased in a rubber and hard plastic shell, it's designed to withstand water submersion. On the front of the device is a 2.7-inch colour touchscreen display, which makes the map interface and menu navigation easy. A small and fiddly stylus is provided, although using a ﬁnger or the sturdy buttons below may be preferable. We had mixed results when it came to performance. Although it locked on to satellites easily enough when in the countryside, we had no such luck in built-up areas. Urban areas may not be its intended environment, but we still expected better performance considering the high-end price. The device comes pre-loaded with a base map – but it's not possible to gain directions from this. Users sticking with the base map can use the Triton to ﬁnd their location, where traditional paper OS (Ordinance Survey) maps can be used alongside. The unit is at its best when you buy a range of additional maps, however. Frequent skiers can add maps that include resorts, trails and lodges, and sea lovers will benefit from nautical maps that display tide and depth information for different parts of the world. You can also add regular OS maps. With the option to follow preset walking routes or create and store your own, there are a few neat features on the Triton. An integrated camera allows users to take photos which are then tagged by location. An onscreen compass, pedometer, weather barometer, LED torch, voice recorder and MP3 player are also included. There's no denying the appeal of the Magellan Triton 2000, and its go-anywhere capabilities will be a draw for outdoor types. It's expensive, however, and at this price the standard mapping should be more comprehensive.